This is an encore presentation from my old blog. Each of these entries is for a Windows Installer product, and you can see in the details that each product was ‘reconfigured’ – luckily, if you have healthy Windows Installers, everything should be happy, and the consistency check just confirms that. If however you have systems that are unhealthy, or the installation has been altered in some way, this could cause a failure during the consistency check, or a failure of the application after the reconfigure. The bottom line is that I expect when I query a WMI namespace, that ONLY a query occurs. Unfortunately, with Win32_Product, that’s not the case. Here’s a KB article for Vista and Server 2008 that explains a scenario with using Win32_Product as a WMI Filter in group policy – the same info applies when querying Win32_Product manually or with an enterprise systems management tool. The article only applies to Vista and Server 2008, but I can confirm that the same thing happens on Server 2008 R2 and Windows 7. Now that we’ve talked about the general issue, let’s talk about where things can go bad with using Win32_Product in ConfigMgr. System Center Update Publisher (SCUP) Using Win32_Product in an Applicability rule will cause every system in your site (regardless of collection membership) to run the query, which causes the consistency check/repair. You can’t control this on a collection level. All clients that are configured to the Software Update Point will perform the scan. This custom update automatically replicates to all children sites with Software Update Points. Each time a scan is run, the Windows Installer consistency check/repair will run. Desired Configuration Management Creating a Configuration item (CI) with win32_product will cause every system that is targeted with the CI to initiate the consistency check/repair each time the baseline rule is evaluated. SMS_DEF.MOF (hardware inventory) Untested, but I believe the consistency check/repair will occur each time hardware inventory runs for all clients in the site. 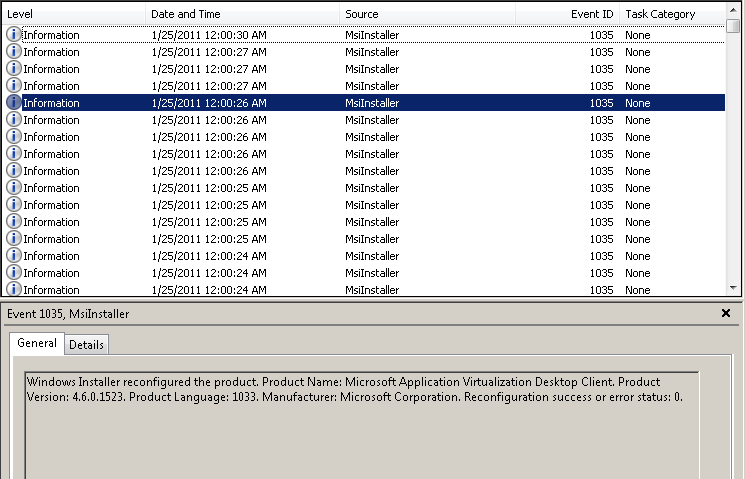 ConfigMgr 2012 App-Model Deployment Types If deploying to USERS, the consistency check/repair will occur when a user attempts to install the software from the software catalog. If deploying to DEVICES, I the consistency check/repair will occur when the client checks to verify that software is installed. So as you can see, in the ConfigMgr world, there are many ways to use win32_product that can cause you to have a bad day. So be careful with win32_product! The good news is that (so far) the message reported is benign, and it doesn’t seem to actually cause a repair. If you encounter a product where this does cause a repair, please send me the info asap.